XLN have taken an interesting approach to SFI charges, offering a sort of insurance. Obviously, I can see why they are doing this. SFI charges are a lot of money and not something the ISP can really cover within the low profit margins, but also not something customers will want to stomach. But the underlying issue is that BT are blaming customer equipment when they simply have failed to find the cause of a fault. 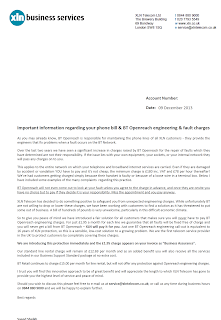 In principle, I am more than happy if BT were to prove the fault was end user equipment to then charge for wasting their time, but in our experience that is rarely the case. So the idea of offering an insurance against the risk of an SFI charge is a novel approach. I hope XLN have the appropriate FSA stuff to offer insurance and are charging insurance premium tax correctly and so on. Or is it not insurance? I wonder. The only thing I would disagree with is that they seem to be forcing this on their customers rather than simply offering it as an option. I suppose I should work out if we should offer something like this at A&A. Comments welcome. It feels like they have just added a charge without consulting us, we are fully capable of looking after 'our end' everything from BTs own main incoming box to the socket. But then, I really rather liked the engineer install of FTTC - any fault before the modem is their fault, and they have to admit it because it's all their gear! "They will try to sneak additional charges onto your bill without notification. Two examples I have had; business assurance, this is essentially an insurance policy to cover repairs to your internal wiring; Non NGN surcharge, a classic where you get charged £3.00 per month for the pleasure of having a substandard service." They've been tacking on "Business Assurance" since 2010 (and it sounds like they make it difficult to opt out). Not something I'd like to see from AA. I think whether it's insurance depends rather on whether the customer is on the hook for these charges if XLN can't pay up. i.e. does BT have the right to bill XLN's customer directly for SFI? If so, then I'd say it's insurance. If not, and BT can only charge XLN for SFI, then it's simply a business decision by XLN not to pass on those charges to its customers. A good point. I was working on the difference between "assurance" and "insurance" in that the former is catering for something that will happen, and the later just something that might happen. 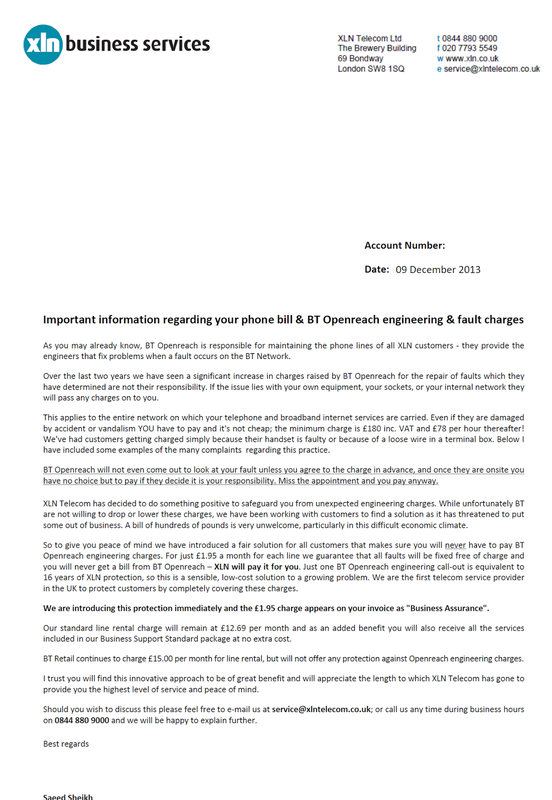 The wording of the letter is that BT will pass on changes to the end user, which is, of course, not the case. Adrian this is how I plan to approach future faults, it will make it very likely I wont have to pay but sadly it probaby wont make openreach do their job. Basically I would say to my isp (which I expect them to pass the same sintructions onto openreach) that I will pay the callout fee when the following conditions are met. Every joint checked between me and cabinet (or exchange if adsl). NTE5 swapped out to rule it out. Pair swapped to rule it out. VDSL port swapped to rule it out. Dropwire swapped to rule it out, or at least use the spare pair thats what it's there for. Am I been unreasonable? not really for £180 even if this takes 3 hours thats £60 per hour, and that is a good fee people would love to make in their respective jobs. I know full well that if any of these disputes ever went to court a judge would laugh at BT claiming they have proven no fault by a quality pair test that is software based (and in my view designed to pass bad lines), BT know this as well which is why whenever I have disputed fees BT have backed down every time. "and in my view designed to pass bad lines"
You have to admit that the people who write the testing software are the most brilliant programmers in the world. Anyone that can write software that can run all day on a faulty line without hiccuping once has got to be really clever! @jelv SOP for diagnostics. In my DECSystem10 days, we used to say "if the diagnostics passed you could say one thing for sure - the power was on. Probably.